This is a site that came about because of my own experience. A prayer life is important. I know this because for many years I was a lukewarm Catholic and prayer was not important in my life. My family and career seemed to be enough, and they kept me very busy. It didn’t seem necessary to pray each day. And I seldom got around to helping other people. This attitude was like a brick wall between me and Jesus. He was more a stranger than a friend. I had failed to follow my earlier dreams, my business ventures were failures, and my marriage was in trouble. I became very depressed and started drinking. A year later, for some reason, I wandered into a Catholic church dedicated to Our Mother of Perpetual Help. 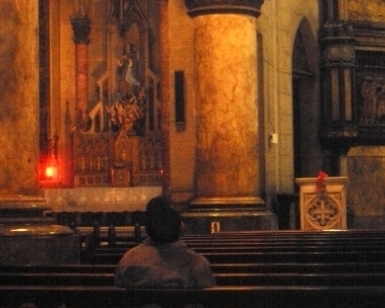 There was hardly anyone in there, but the red sanctuary light was visible — so I knew the Lord was present. She led me back to her Son and I poured out my heart to Him. I honestly admitted my sins and apologized for the many times that I had ignored Him. I asked for His forgiveness and help. I realized that Jesus still loved me. He had not rejected me, despite my faults. His love is not conditional. As I accepted this, my spirit felt as if a heavy weight had been lifted from it. There was a new joy in my heart. I knew that prayer and the Light of Christ had to be an important part of my life. Now, I set aside Quiet Time each day to pray and to say the rosary. Devotion to the Sacred Heart and receiving the Holy Eucharist give me peace and joy. Jesus reveals Himself to me when I read the Bible. There are still problems in my life. Now, instead of trying to handle everything myself, I tell Jesus I am in trouble and need His help. And He is there for me, despite my past failures. Sometimes it takes a tragedy to realize what is important in your life. When you or a loved-one gets seriously sick, you quickly find out. If you have been away from Jesus for a long time, don't let anything or anyone stop you from coming back to Him. You will find peace in your life when you put Jesus first in your life. My prayer is that you continue to grow closer to Jesus. The Light of Christ... Lumen Christi... will guide you. James Lawrence is a retired college teacher. He holds degrees in education and philosophy and a bachelor of sacred theology from the Pontifical Institute (University of Toronto). James has been an RCIA program instructor. He wrote a book called Lumen Christi for his RCIA classes.